Stay at this Houston, Texas hotel providing convenient access to a variety of key area attractions and corporate locations. Whether traveling for business or pleasure, the Best Western Windsor Suites offers the best in customer service and convenience. 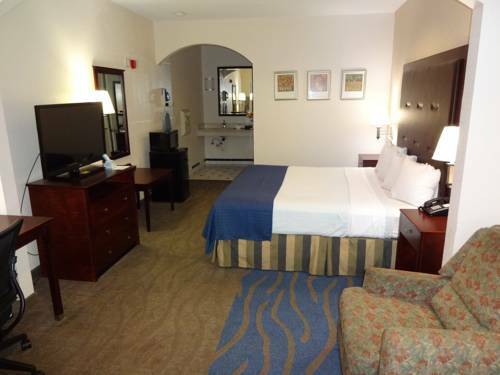 Our convenient exterior corridors proudly offers spacious guest rooms each featuring cable satellite television and free high-speed Internet access. Begin the day with a complimentary continental breakfast before taking a dip in the outdoor patio cover swimming pool. Take advantage of other full-service amenities including a fitness center, guest laundry, business services and meeting facilities accommodating up to 30 people. This Best Western Windsor Suites is located near a variety of local restaurants and shops. Spend the afternoon in downtown Houston touring through the Houston Museum District or visit the NASA Johnson Space Center. Corporate travelers will appreciate being so close to Cy-Fair Hospital, Daniel Industries, Hewlett Packard and Exxon/Mobile locations. Guests will also enjoy key area attractions such as Willobrook, Bear Creek and Tinseltown, all located less than ten miles from the hotel. The friendly helpful staff at the Best Western Windsor Suites is ready to ensure a fun filled memorable stay in Houston, Texas. Make a reservation today and save! Enjoy your stay. From: Highway 290 East. Exit onto FM 1960 and Highway 6. At the stoplight, turn right. Stay on the service road and make a u-turn under the bridge. The Best Western Windsor Suites is on the left-hand side. From: Highway 290 West. Exit onto FM 1960 and Highway 6. At the stoplight, turn left under the bridge. The Best Western Windsor Suites is on the left-hand side. 0.10 mile(s) from Chili's , bar/lounge, American, open for: lunch, dinner, Hours: Monday-Thursday 11:00 a.m. 11:00 p.m. Friday-Saturday 11:00 a.m. 12:00 a.m. Sunday 11:00 a.m. 10:30 p.m.
0.10 mile(s) from IHOP , cafe, American, open for: breakfast, lunch, dinner, American breakfast, lunch and dinner served 24-hrs daily. 1.00 mile(s) from Chipotle, fast food, Mexican, open for: lunch, dinner, Specializing in burritos & tacos. 11:00 a.m. to 9:00 p.m.
0.30 mile(s) from Luby's , buffet, American, open for: breakfast, lunch, dinner, Family-friendly, cafeteria-style chain offering Texas-inspired entrees, sides & desserts. Hours: Monday-Friday 11:00 a.m. 8:00 p.m. Saturday-Sunday 8:00 a.m. 8:00 p.m.
Across the street from La Madeline, cafe, French, open for: breakfast, lunch, dinner, Quaint French cafe chain serving rustic country fare, espresso & fresh-baked baguettes. 18 mile(s) from The Galleria, Spanning 2.4 million square feet of space, housing 400 fine stores and restaurants, two high-rise hotels, and three office towers, The Galleria is Houston's most renowned shopping mall. 11 mile(s) from Houston Premium Outlets, Found just 11 miles West on Hwy 290, experience one of Houston's premiere outlet malls with a wide variety of high end stores to choose from with remarkable savings.